Have you enjoyed making these little mini hexagons. 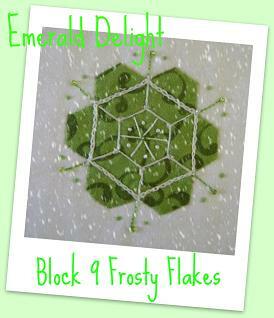 I did and Here is the last Frosty Flakes Block. and to me is so Christmassy. Something about aqua blue that I love atm. I am behind but I love making them. I had never done hexies before. It is funny that my first ones are so small. It will be odd to do big ones. Thank you for these patterns. Thank you again for the terrific pattern. I'm making the hexies first and then will do the embellishing. They are so little and so much fun to do. It's gorgeous dear Dawn - just gorgeous - so elegant! But I must admit the aqua is my favorite too, the color of a tropical ocean meeting the beach....sigh. I will pop this one away in my folder with the others ,thank you Dawn. Another great block , Dawn was fun, fun, fun. am posting finished block to flicker in just a sec! Great fun, had a blast doing these, amm going to make a 2nd and 3rd set as ornaments for the tree in different colors...... what are we doing next?, lol want to come over and do my monday mystery stitch projects? thank you so much, but ... I can't downlod with internet explorer and firefox. posted a second one on flicker and I too could not download it, so i just worked off of the picture on your blog. Ya solo me falta el nº 9, ésta tarde lo empezaré, muchísimas gracias por el sal...Yo estoy encantada...Otra vez gracias Adelaide.Kiss for you. These have been the cutest. I'm working on my craft room right now and don't have anywhere to sew so I am collecting them and will make them after the room is done. Again, thank you for these, they are cute. Another nice block but I am not able to download it. Thank you very much for giving it to us. Thank you for the beautiful project, I love it! I'm making it slowly and I just finished the third Frosty Flake. This project is my first experience with hexagons. It is also a lovely one but I'm one of those who can not download the block. The instructions did not give any problems. I, too, can't download this block. It says the server is busy but I downloaded the finishing instructions just fine. I use firefox. I can't get the download to work either. Love the design. Am embarrassed to say I've fallen behind. 1-5 are done and dusted. Blocks 6-9 await my attention. But I have a bunch of friends who want to do it too .. so that will spur me on to finish mine before they come for a Snowflake Bee on October 13th.